Cholesterol is transported through the blood by lipoproteins which direct cholesterol to where it is needed. There are several types of lipoproteins that are classified by their density or ratio of lipid to protein. The lower the protein, the less dense it is. LDL lipoproteins contain the highest percentage of cholesterol and are the major carriers through the bloodstream. LDL and its receptor form a vesicle which fuses with a lysosome that releases the cholesterol for use in membrane biosynthesis or cellular storage. HDL lipoproteins transport cholesterol back to the liver for excretion or reprocessing. High levels of HDL lipoproteins are associated with better health outcomes. LDL and its receptor form a vesicle which fuses with a lysosome that releases the cholesterol to be used in membrane biosynthesis or to be stored in the cell. When a cell has sufficient cholesterol LDL receptors are blocked, but when the cell is deficient, more LDL receptors are created. If the system breaks down, LDL lipoproteins accumulate in the blood, are engulfed by macrophages, and may become trapped on the walls of blood vessels to form plaques. lipoprotein: Any of a large group of complexes of protein and lipid with many biochemical functions. chylomicrons: Chylomicrons are one of the five major groups of lipoproteins (chylomicrons, VLDL, IDL, LDL, HDL) that enable fats and cholesterol to move within the water-based solution of the bloodstream. A cholesterol test will measure your HDL, LDL, VLDL, and triglyceride levels. The ratio of HDL to LDL is a useful screening method to determine your possible risk for heart disease or stroke. Cholesterol is only slightly soluble in water; it can dissolve and travel in the water-based bloodstream at exceedingly small concentrations. Since cholesterol is insoluble in blood, it is transported in the circulatory system within lipoproteins, which are complex discoidal particles that have an exterior composed of amphiphilic proteins and lipids whose outward-facing surfaces are water-soluble and inward-facing surfaces are lipid-soluble; triglycerides and cholesterol esters are carried internally. Phospholipids and cholesterol, being amphipathic, are transported in the surface monolayer of the lipoprotein particle. liposome structure: Lipid vesicles (or liposomes) are small, intracellular, membrane-enclosed bubbles of liquid within a cell. 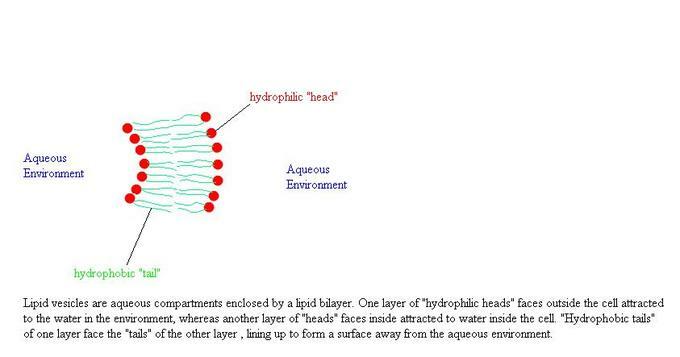 They are formed because of the properties of lipid membranes, where the hydrophobic chains are packed together so they are not in contact with the aqueous solution. The more lipid and less protein a lipoprotein has, the less dense it is. The cholesterol within all the various lipoproteins is identical, although some cholesterol is carried as the “free” alcohol and some is carried as fatty acyl esters referred to as cholesterol esters. However, the different lipoproteins contain apolipoproteins, which serve as ligands for specific receptors on cell membranes. In this way, the lipoprotein particles are molecular addresses that determine the start and endpoints for cholesterol transport. Chylomicrons, the least dense type of cholesterol transport molecules, contain apolipoprotein B-48, apolipoprotein C, and apolipoprotein E in their shells. Chylomicrons are the transporters that carry fats from the intestine to muscle and other tissues that need fatty acids for energy or fat production. Cholesterol that is not used by muscles remains in more cholesterol-rich chylomicron remnants, which are taken up from here to the bloodstream by the liver. VLDL molecules are produced by the liver and contain excess triacylglycerol and cholesterol that is not required by the liver for synthesis of bile acids. These molecules contain apolipoprotein B100 and apolipoprotein E in their shells. During transport in the bloodstream, the blood vessels cleave and absorb more triacylglycerol from IDL molecules, which contain an even higher percentage of cholesterol. The IDL molecules have two possible fates: half are metabolized by HTGL, taken up by the LDL receptor on the liver cell surfaces and the other half continue to lose triacylglycerols in the bloodstream until they form LDL molecules, which have the highest percentage of cholesterol within them. LDL molecules, therefore, are the major carriers of cholesterol in the blood, and each one contains approximately 1,500 molecules of cholesterol ester. The shell of the LDL molecule contains just one molecule of apolipoprotein B100, which is recognized by the LDL receptor in peripheral tissues. Upon binding of apolipoprotein B100, many LDL receptors become localized in clathrin-coated pits. Both the LDL and its receptor are internalized by endocytosis to form a vesicle within the cell. The vesicle then fuses with a lysosome, which has an enzyme called lysosomal acid lipase that hydrolyzes the cholesterol esters. Now within the cell, the cholesterol can be used for membrane biosynthesis or esterified and stored within the cell, so as to not interfere with cell membranes. Synthesis of the LDL receptor is regulated by SREBP, the same regulatory protein as was used to control synthesis of cholesterol de novo in response to cholesterol presence in the cell. When the cell has abundant cholesterol, LDL receptor synthesis is blocked so new cholesterol in the form of LDL molecules cannot be taken up. On the converse, more LDL receptors are made when the cell is deficient in cholesterol. When this system is deregulated, many LDL molecules appear in the blood without receptors on the peripheral tissues. These LDL molecules are oxidized and taken up by macrophages, which become engorged and form foam cells. These cells often become trapped in the walls of blood vessels and contribute to artherosclerotic plaque formation. Differences in cholesterol homeostasis affect the development of early atherosclerosis (carotid intima-media thickness). These plaques are the main causes of heart attacks, strokes, and other serious medical problems, leading to the association of so-called LDL cholesterol (actually a lipoprotein) with “bad” cholesterol. Also, HDL particles are thought to transport cholesterol back to the liver for excretion or to other tissues that use cholesterol to synthesize hormones in a process known as reverse cholesterol transport (RCT). Having large numbers of large HDL particles correlates with better health outcomes. In contrast, having small numbers of large HDL particles is independently associated with atheromatous disease progression within the arteries. Cholesterol Blood Tests: Reference ranges for blood tests, showing usual, as well as optimal, levels of HDL, LDL and total cholesterol in mass and molar concentrations, is found in orange color at right, that is, among the blood constituents with the highest concentration.